Chinese kitchen appliance maker Vatti is going to pay customers about 79 million yuan after France’s triumph at the World Cup 2018 in Moscow, Russia. In May, Vatti promised that customers who bought a specific set of “championship products” in June would receive a full refund of the purchase price if France were to win the tournament. The full product set, which costs up to 4,999 yuan, includes a gas stove and a ventilator. The company has announced on its website that the full refund on any purchase of their “championship set” over promotion period has kicked-off and the deadline of application will be on 24 July. It’s expected that the bill will be about 79 million yuan but Vatti said that the refund will have little impact on the bottom line. 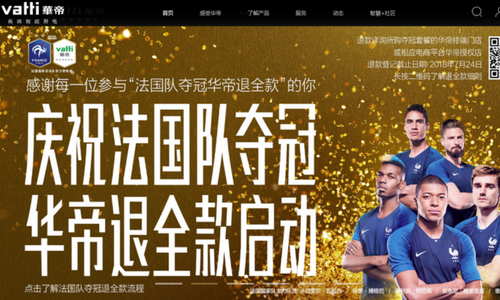 Vatti reported that this World Cup marketing campaign has significantly improved the online and offline sales, and brand awareness. The company said on 4 July that offline sales volume for designated products amounted to 50 million yuan during the promotional period, accounting for about 7% of total offline sales volume－more than 700 million yuan. Online sales volume for designated products amounted to 29 million yuan during the promotional period, accounting for about 9.67% of total online sales volume of more than 300 million yuan. Sketches about true beauty, a robot named Edgar and a rock anthem are among the most popular ads on YouTube in the country last ye..